Dubai does not do anything small. 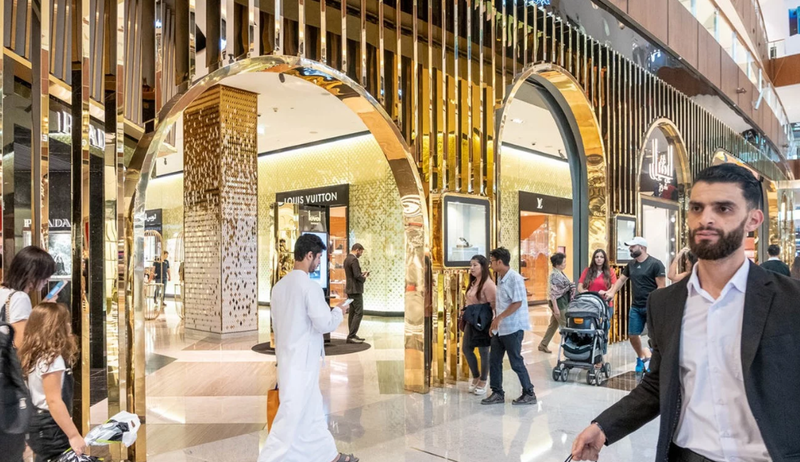 Dubai has about 65 malls in a city of just over three million people, with 10 more on the way. 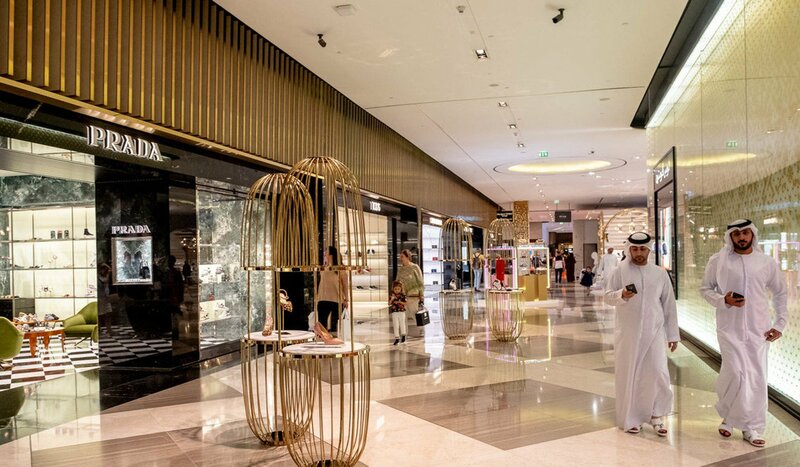 For some, the malls are the most iconic part of Dubai. And no mall is more iconic than The Dubai Mall. 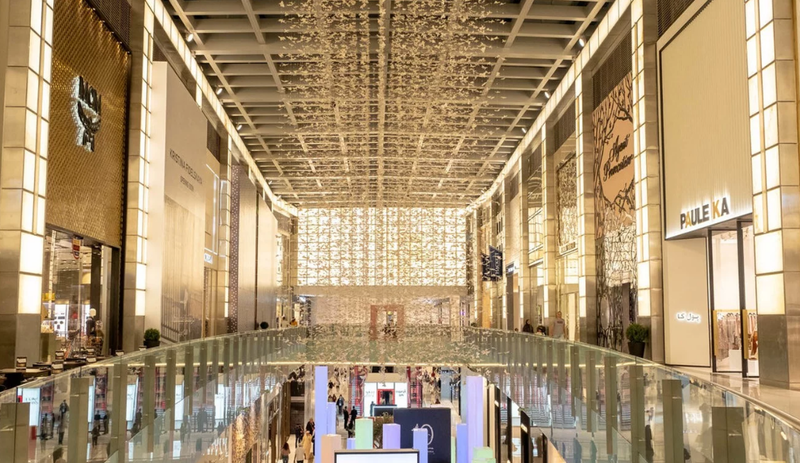 Opened 10 years ago, The Dubai Mall is the second-largest mall in the world by total land area after being surpassed by the New Century Global Center in China in 2013. To call it a mall is an understatement. Aside from more than 1,200 stores, the mall has its own neighbourhoods – like a high-fashion district akin to Fifth Avenue, and The Village, an open-air street – as well as hundreds of restaurants, cinemas, a luxury hotel, an Olympic-size ice skating rink, a virtual-reality theme park, and an aquarium. The entire complex cost US$20 billion to build. 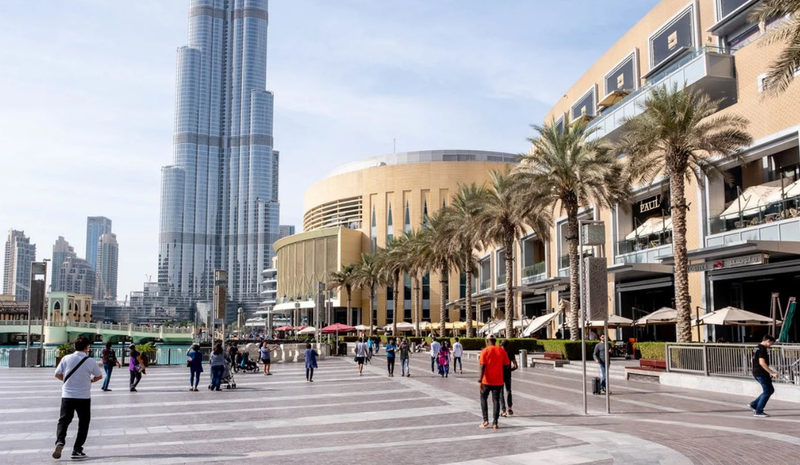 Despite talk in the United States of a “retail apocalypse” shutting down America’s malls, no such danger appears to be in sight for Dubai. 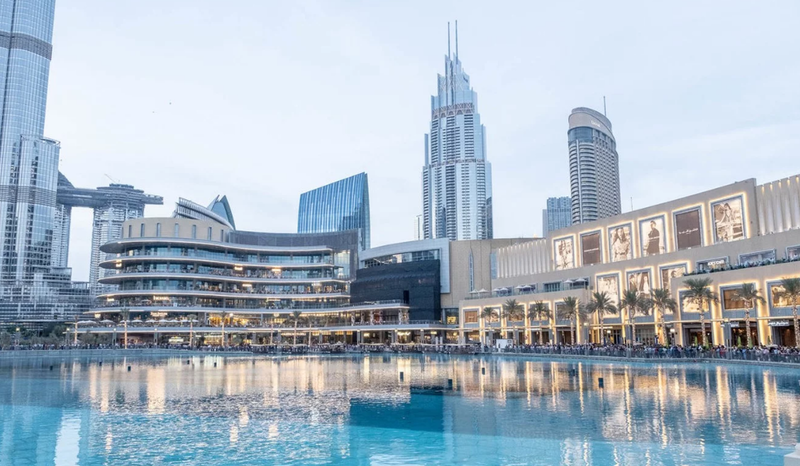 Emaar Malls, The Dubai Mall’s developer, said recently that the property had seen over 80 million visitors annually for the past four years, making it the most visited mall in the world. 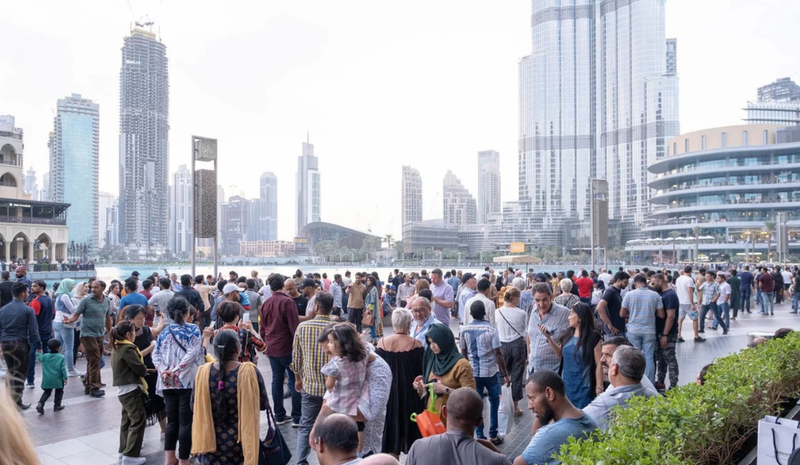 Dubai is climbing in the rankings of the most visited cities in the world – it is currently fourth, with a projected 16.7 million visitors this year, according to Mastercard’s Global Destination Cities Index. 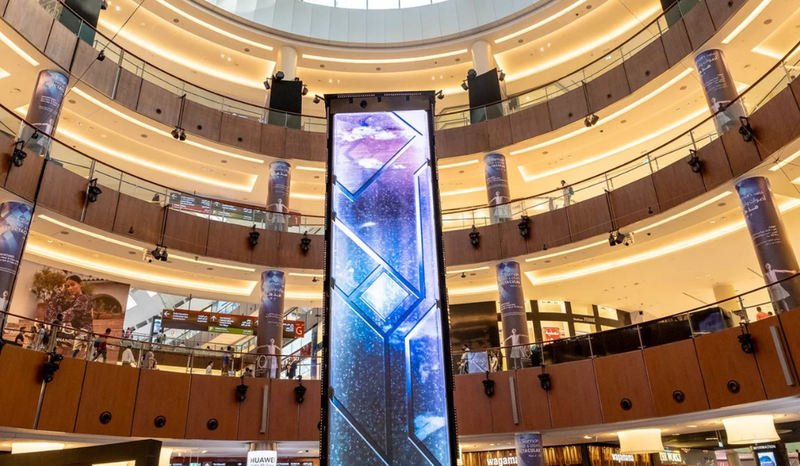 And as US News & World Report named The Dubai Mall is the number one attraction in the city, that ranking is likely to climb. So as a first time visitor to Dubai, it was a must visit. 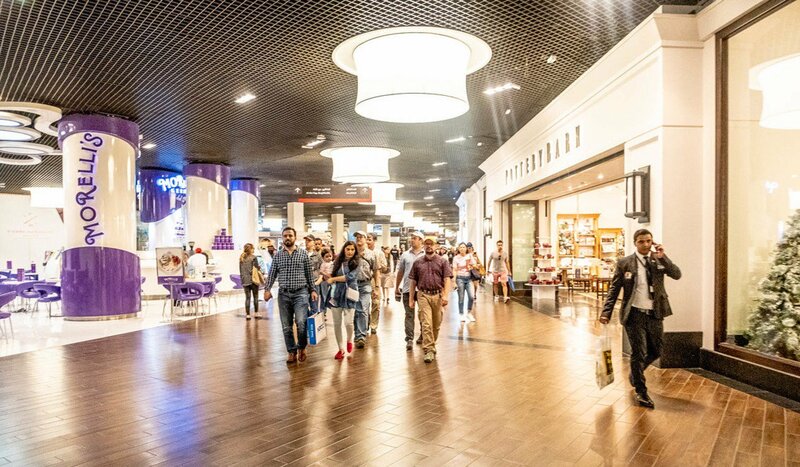 At over 13 million square feet and with more than 5.9 million square feet of internal floor area, The Dubai Mall is immense. 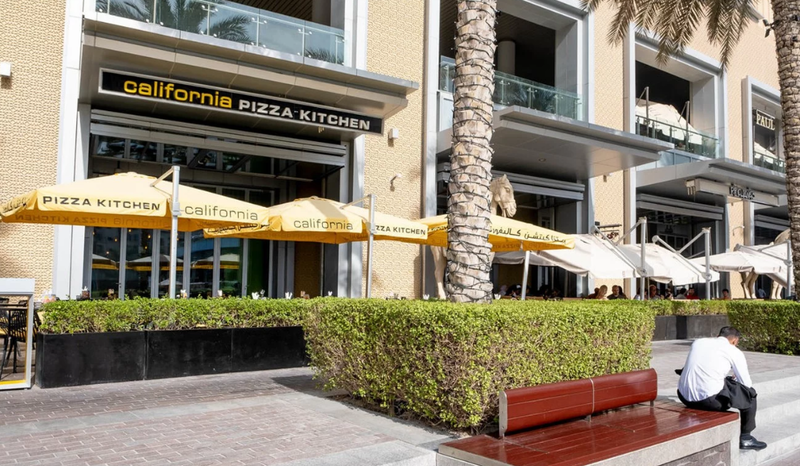 California Pizza Kitchen at The Dubai Mall. … and a Pottery Barn. But it is cool inside, which is welcome respite to the midday heat outside. One of the many entrances brings you into the airy Star Atrium. 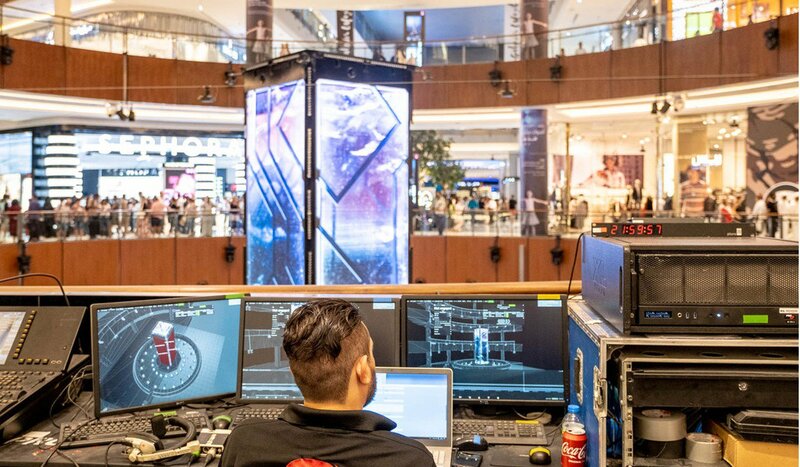 The column in the centre is part of an eight-minute interactive show called Talisman by the founder of Cirque du Soleil. 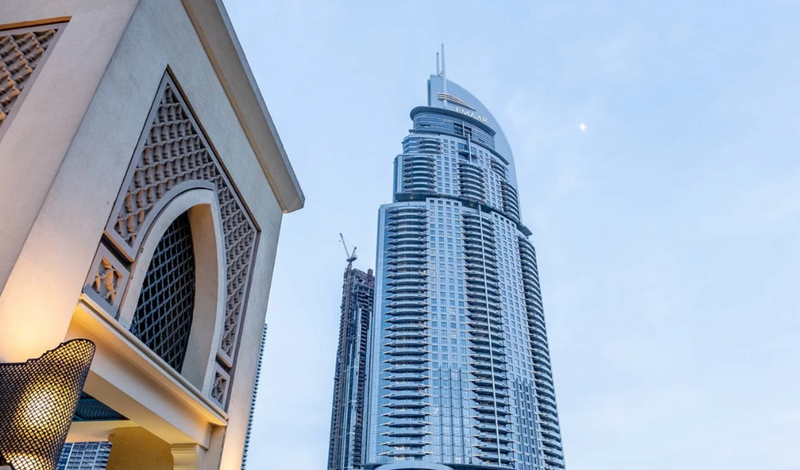 The Dubai Mall has been an unmitigated success for developer, Emaar Malls, which also developed the Burj Khalifa. 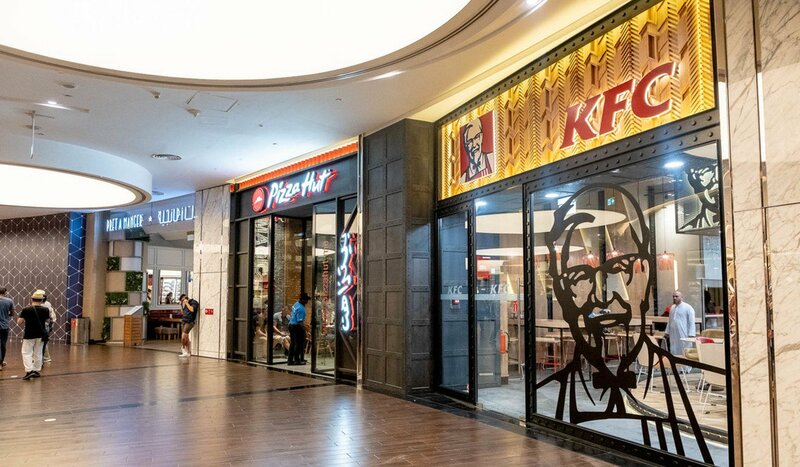 A massive draw is that it is a mini-America for populations that does not get access to American brands, and we are not just talking big names like KFC and Pizza Hut. There is a Magnolia Bakery and a Mighty Quinn’s Barbeque, which are two small, high-end restaurants based in New York. 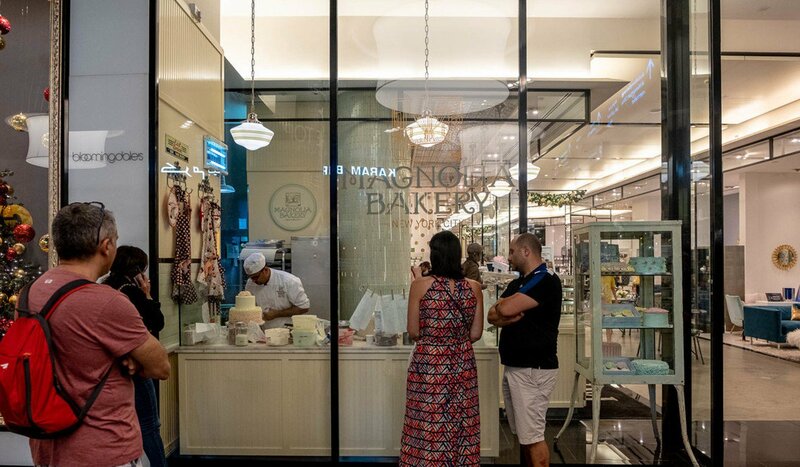 Magnolia Bakery at The Dubai Mall. It would be easier to name the American brands that are not represented than those that are. There is even a location of the Cereal Killer Cafe, the cheeky hipster London cafe that started a mini-uproar over the price of its cereal bowls when it opened in 2014. 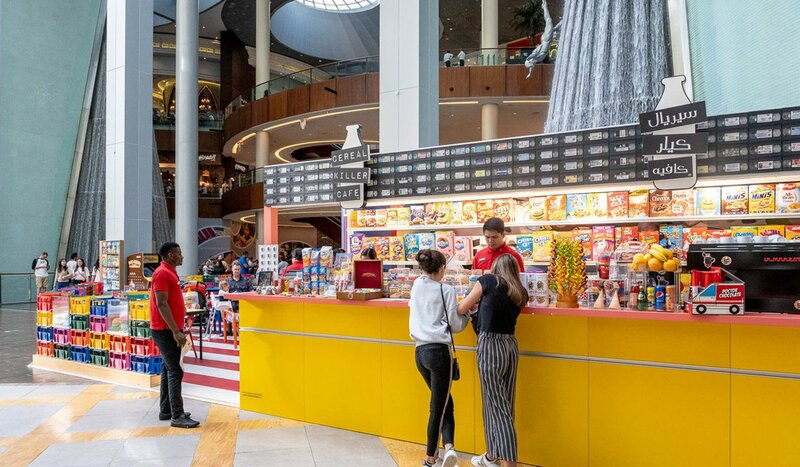 Cereal Killer Cafe at The Dubai Mall. 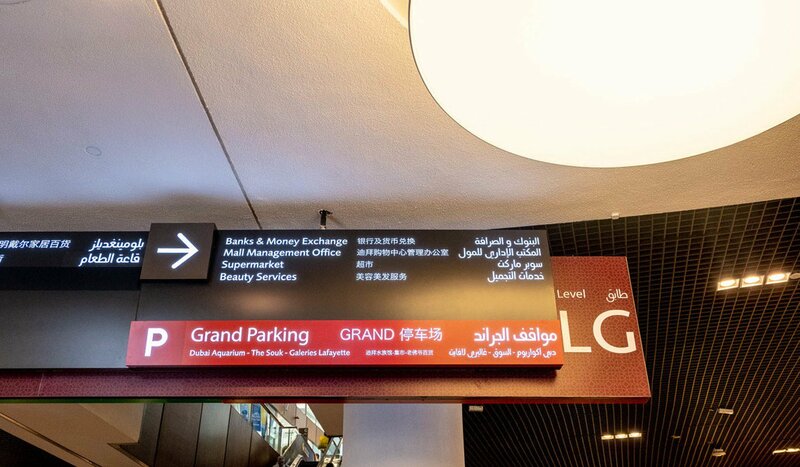 And Dubai’s fastest-growing market is China, with 764,000 visitors last year, which could top one million this year. 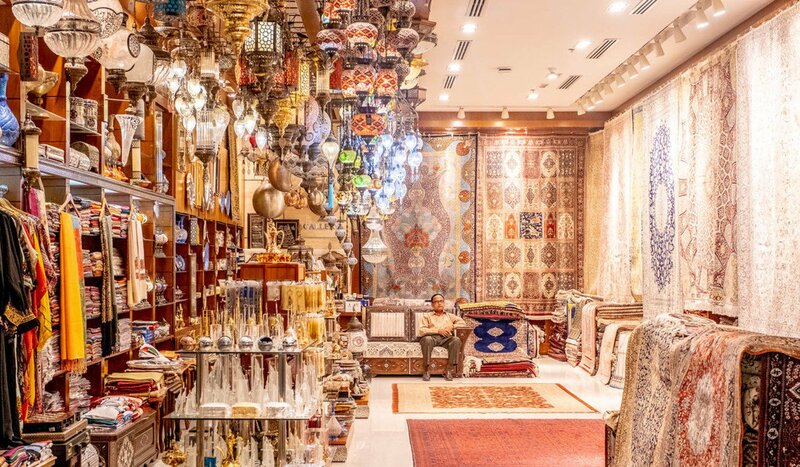 … or one sells traditional Arabian rugs and carpets, lighting, and other knick-knacks. The mall feels like the retail version of an Avengers film: overstuffed with blockbuster elements to the point where it is sensory overload. But there are some parts that amaze, like The Waterfall, a nearly 80-foot cascading art installation. 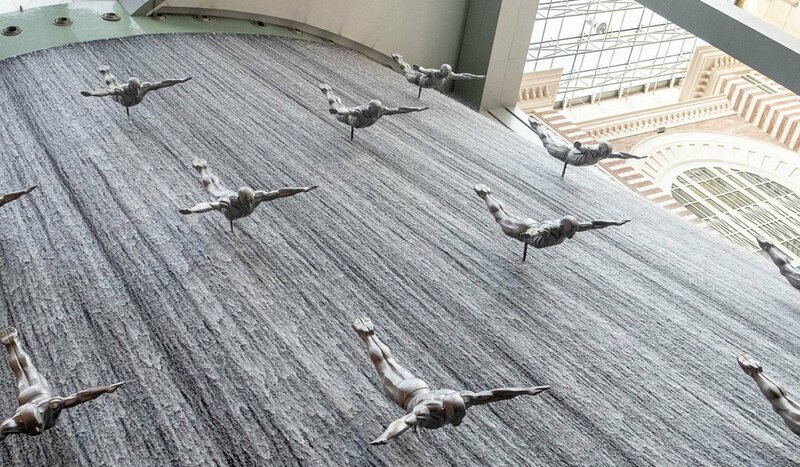 The Waterfall at The Dubai Mall. 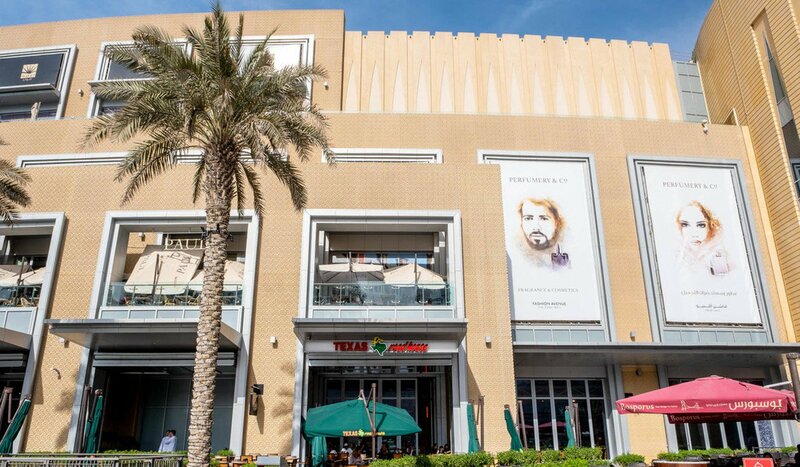 The mall is so big that it even has its own neighbourhoods, like The Village, which attempts to conjure a naturalistic streetscape with cafes, restaurants, and casual clothing stores. 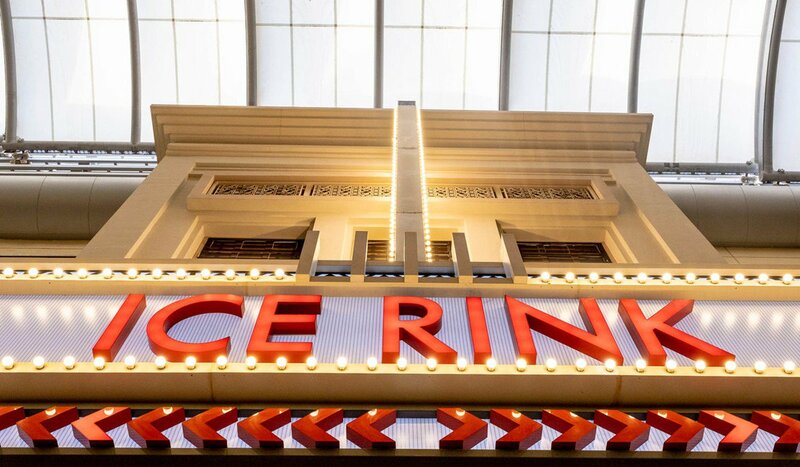 One of the mall’s main attractions is its Olympic-size ice skating rink. 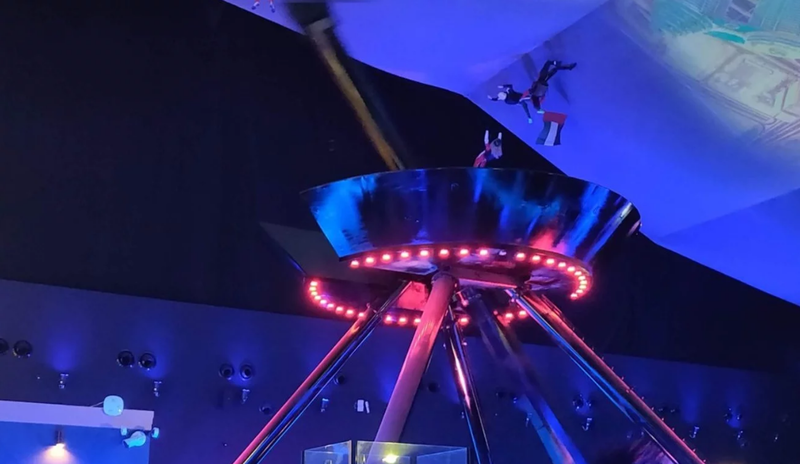 The Olympic-size ice skating at The Dubai Mall. There are more than 300 spectator seats, as well as group lessons, private coaching sessions, and even ‘disco nights’. There is also a store that sells skating and ice hockey merchandise. The mall is very easy to get lost in. There are maps around, but this is a true labyrinth of consumerism. 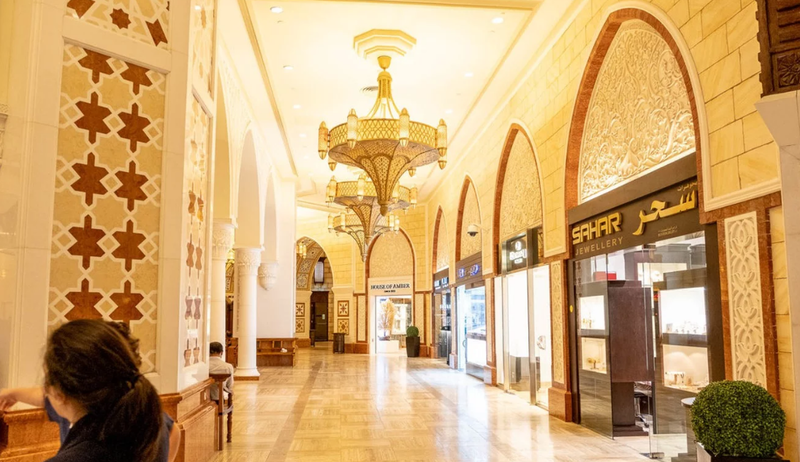 One of the more inspired parts of the mall is The Souk, a neighbourhood that mimics a traditional marketplace seen in the Middle East and North Africa. 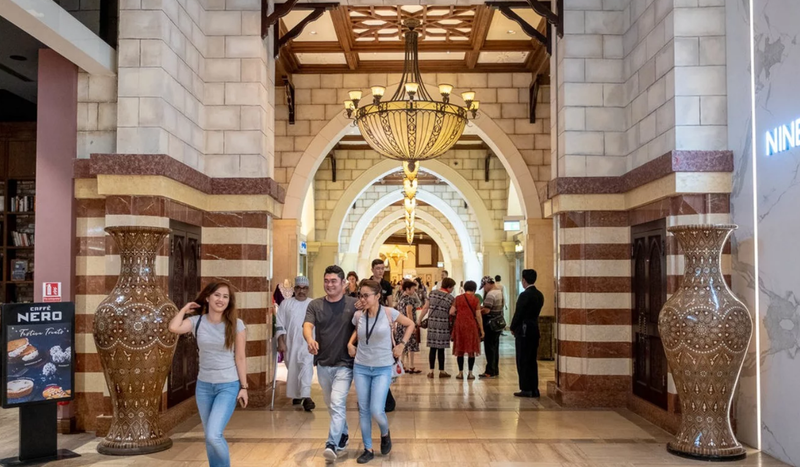 The Souk features several jewellery shops, traditional Arab handicrafts, and gold shops, but it is the architecture and design of the space that is most stunning. 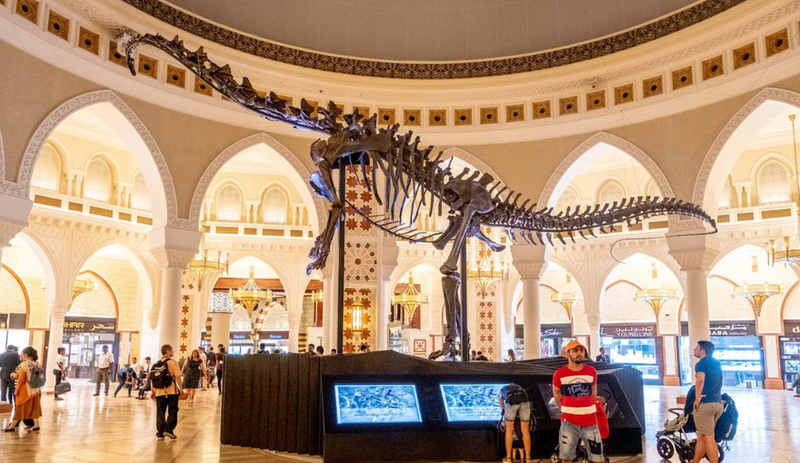 At the centre of The Souk is the Grand Atrium, featuring a 155-million-year-old diplodocus longus dinosaur fossil found in Wyoming. The a 155-million-year-old diplodocus longus dinosaur fossil. Photo: Harrison Jacobs The a 155-million-year-old diplodocus longus dinosaur fossil. A stop at % Arabica, a specialty coffee chain that started in Kyoto, Japan, is also a highlight. 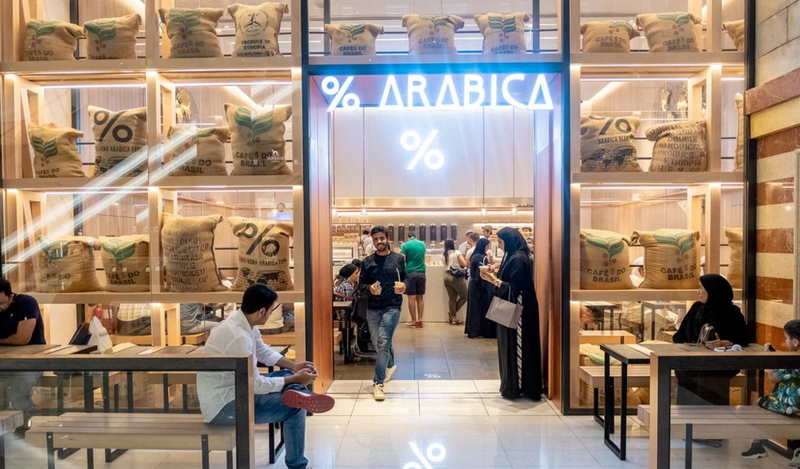 % Arabica at The Dubai Mall. 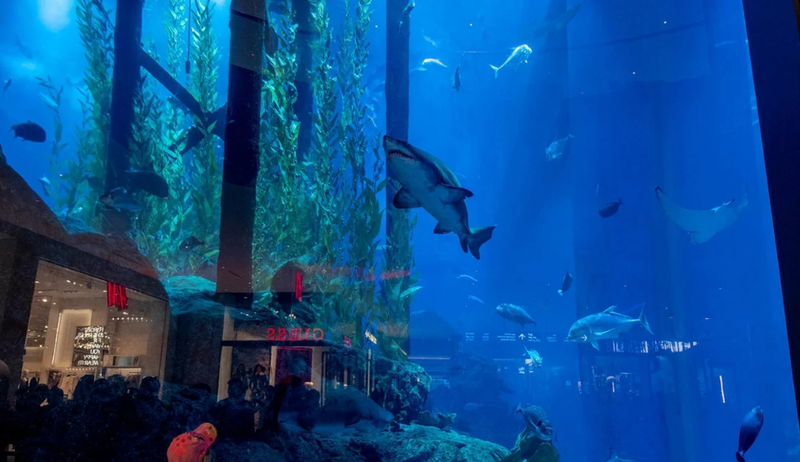 The 2.65-million-gallon tank that forms the centrepiece of the Dubai Aquarium and Underwater Zoo is also worth a visit. A ticket to go inside is nearly US$40, with glimpses of the sharks and stingrays in the tank from the outside totally free. 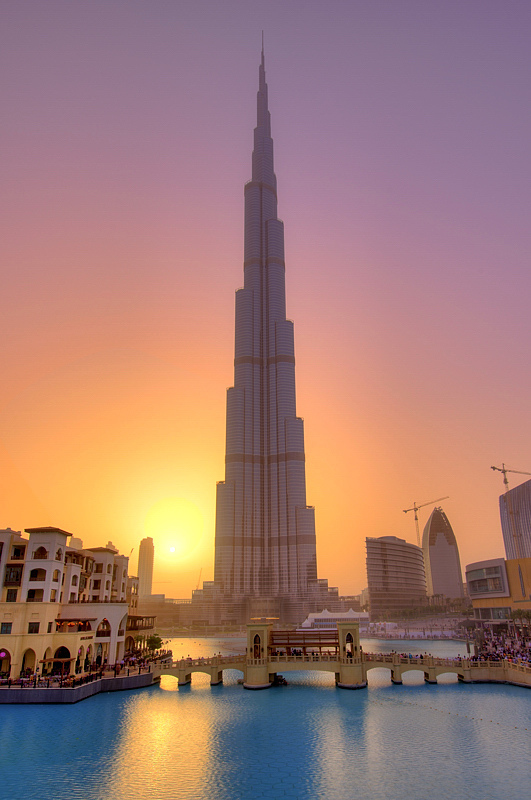 The Burj Khalifa towers over the area like some dystopian tower from The Wizard of Oz. The other buildings that flank the Dubai Mall are not too shabby either. … that is right, Apple. The Apple store at The Dubai Mall. 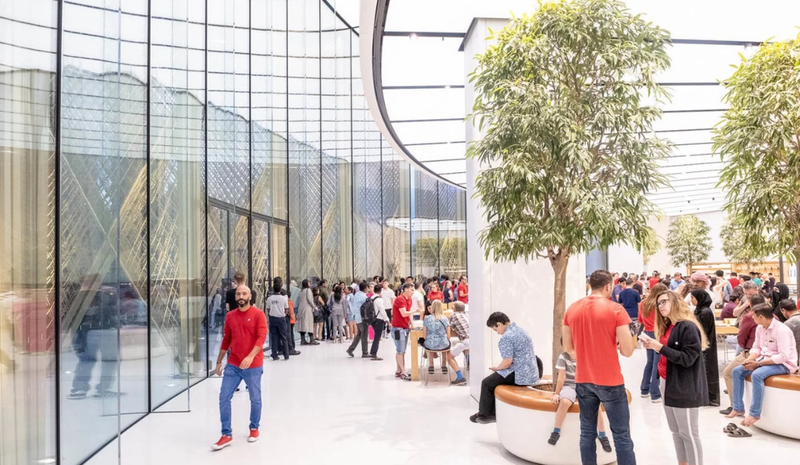 And if you want to hang out on Apple’s picture-perfect balcony for the best Burj selfie, you have to wait in a long line, as if you are trying to buy the new iPhone. 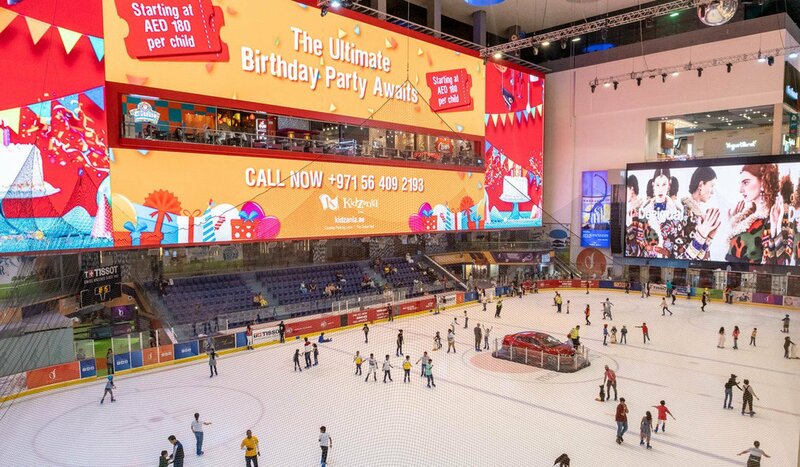 If all that was not enough, The Dubai Mall just keeps getting bigger. 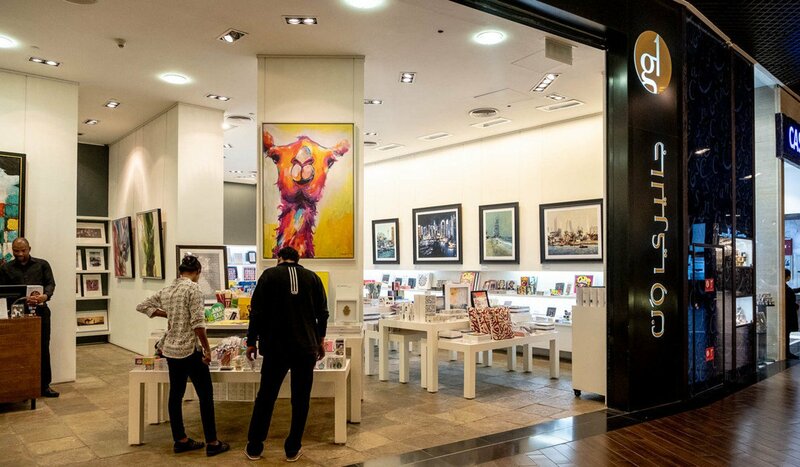 Earlier this year, the mall opened its latest addition, Fashion Avenue. 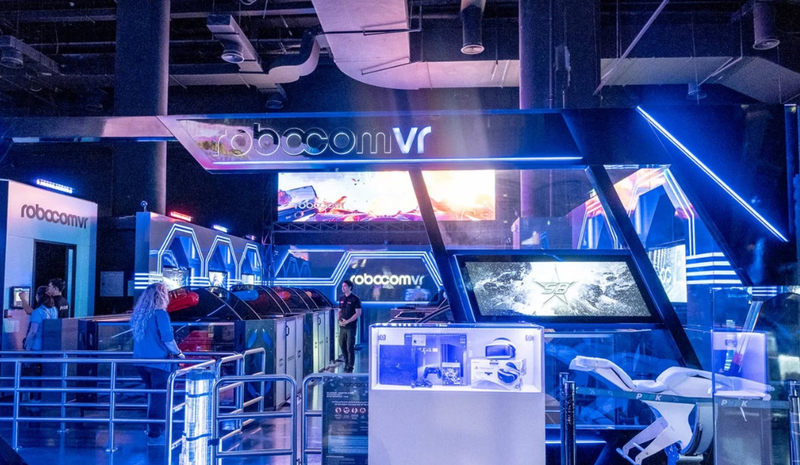 The most fun part of the mall is one of its newest additions, a 75,000-square-foot virtual-reality theme park. 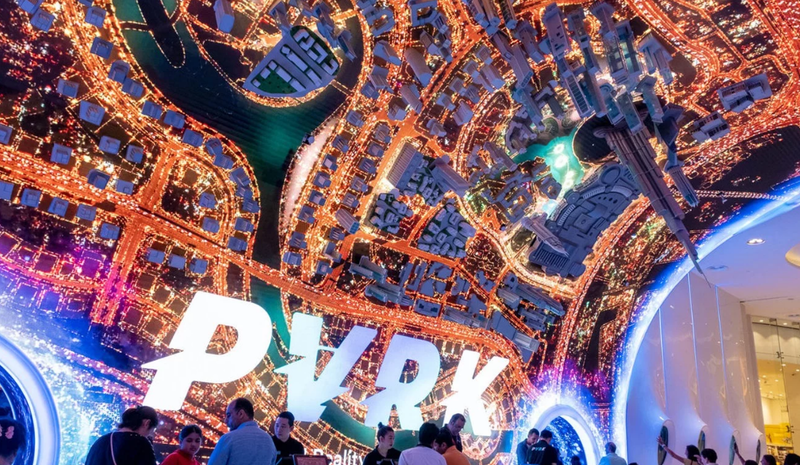 The park opened earlier 2018 year and is already one of the more popular attractions in the mall. 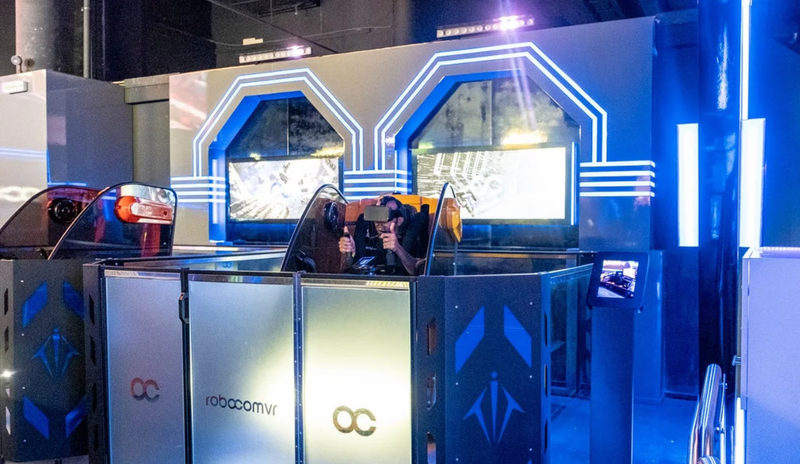 There is also a skydiving simulator that spins you up and down in big carnival-ride-like machine while the virtual-reality goggles show you the skyline of Dubai. Overall, there is nothing there that most tourists cannot get somewhere in their home country, unless a particular attraction catches your eye. 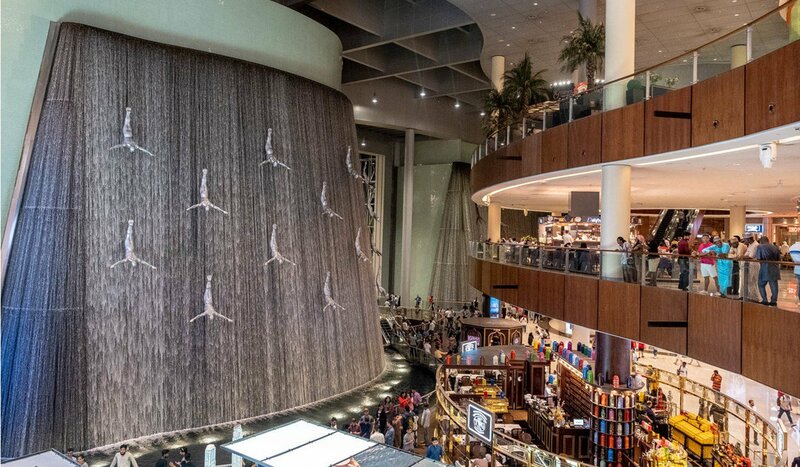 But The Dubai Mall’s team always seems to have a few surprises up its sleeve, like the US$218 million Dubai Fountain, the world’s largest choreographed fountain system.